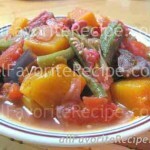 Tortang Talong is an eggplant omelet which is very simple healthy eggplant recipes and very budget friendly dish. 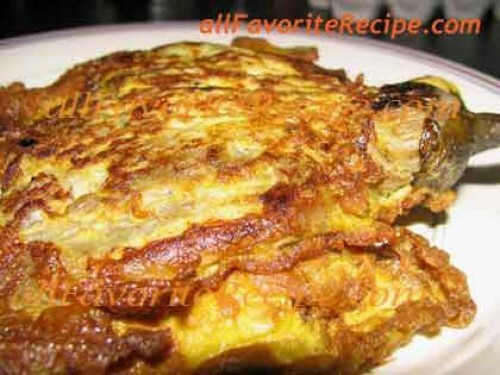 This Tortang talong is very popular in the Philippines specially at Turo-turo eateries because it very affordable. In this recipe, we broiled the eggplant until tender to make its skin easy to peel. Broil eggplants until tender (the skins are charred and blister appears). Once cool, peel off the skins of the eggplant and retain the crown and the stem. Gently flatten its meat by using the back of a fork. Set aside. In a bowl, beat the eggs and season with salt and pepper. In a skillet, heat oil over medium heat. Dip each eggplant, one at a time into the egg mixture. Gently bring the bowl near the skillet and tip, lowering the eggplant onto the heated oil. Fry until golden brown on one side, then turn and brown the other. Drain on paper towels. Keep warm and serve. 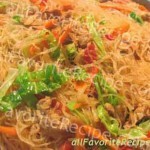 Love to Cook This Talong! I would say mine is the best with basil and dried chilies mixed with battered eggs. i’m telling you, you gonna love it more. My daughter-in law also adds diced tomato and chopped onion to one side when she dips the slices in the egg mix. Eggplants are hard to come by where I live, especially the smaller ones. Masarap din lagyan ng bellpepper, minced onion and then shrimps. add lang bagoong mas sobrang sarap!! masarap kapag may minced onion, and garlic, and butter too, you may also add condensed milk sa egg.. If you add a small amount of grated Parm cheese to this recipe it will be even tastier.